Two of our 2005 Boards members have sighted the two new Animated Wave 2 deluxe figures – Blackarachnia and Autobot Ratchet – in the Cincinnati area today. NotFastEnuff reports finding both figures at a KMart in Florence, KY while DeeJay reports finding the two at a KMart in Forest Park, OH. Those in the area for BotCon 2008 this weekend may want to visit the local stores again for these new figures! Yes, Sportsfans, the scalpers are out there for Wave 2. After 8 K-Marts, 4 Wal-Marts, and driving around nearly 3/4 of the I275 loop, I've only seen a handful of the two figures so far. One TFW2005 member is getting a set, and I'm keeping a set. Are you sure the scalpers are entirely responsible? I have a personal theory that, with BotCon come and gone, shipments to Cinci are in the process of ending, or already have, and you will simply be winding down what is already in the area until it's gone. At that point, I expect shipments to resume on the normal release schedules, starting with Wave 1 again. Obviously I can't prove that, yet, but that's what I expect to happen or to already be occuring. And deltastars sets are made to be sold and can have more made, these were limited peices that they were scooping up away from other people who wanted them, and then selling Rodimus and Megatron seperatly for double price. THATS SCALPING BY DEFINITION! The sets were sold well into Saturday before they finally ran out. Ccalping requires one to create an artificial shortage in order to profit from it. If you agree that the sets lasted a reasonable time, then there was no "shortage" created by them having a single extra set over what you THINK they should have had, whether or not you agree with what they should be allowed to have. Even if you believe there was a shortage of sets, period, and not enough to go around, then they can't be scalping, because the shortage was not their creation in the first place. If they got that extra set from someone who didn't want their allocated set anyway, then your entire complaint falls apart, as you can't say that potential third party didn't have the right to buy their one set and pass it on or resell it. They may even have paid that person more than the cost, which in your book makes that potential third person the scalper, not the person you insist on demonizing. If you can't be in line by that point, the THIRD DAY, then you can't really want the product very bad. As far as I can tell, everyone who wanted a set and made an effort to actually get in line and GET one, got it. Fun Pub followed the limits all through Thursday and Friday before allowing seconds and they still lasted a long time. Even my friend who arrived late on Friday evening and just BARELY got to pick up his box set through the extreme kindness of a FunPub staffer, had no trouble at all getting himself into the line at a reasonable time Saturday morning and getting a set. You judge to easily and quickly, when you simply do not know the facts. It's not cool to go around slandering someone for their actions or what they had when you have no idea of the circumstances. Making assumptions is a poor place to start from. I am sorrowful oh Internet Celebrity. Had I known your want for the Wave 2 guys we would have definately made a point of it to pick up a set for you. They're all up on eBay, you can count on that. Take a gander at an Animated search under Transformers, 90 % Ohio based. Nobody can lay claim to my title of Undisputed King Scalper. Nobody. Wanted to clarify a misconception I read earlier too: BBTS had several Animated toys for sale, and the deluxes were $20. Though I did see many people talk them down to $15. This wasn't on Saturday…. This was on Friday, and the phrase was "I've sold 2 of these at $150 (Megatron ONLY)" And he was trying to sell a third so that is at least three sets on friday he had. And…. THIS is what was happening, so while I'm GLAD you were trying to be honest and we're all better people for having an honest dealer… THIS guy was not. and I'm LUCKY I got my Megatron set. and I pity the people who wanted him and have to pay ebay prices because people who bought them JUST to sell them got in line first. You are still being entirely too literal with his statement. It's no different that me stating that I had sold out of some of Deltastar's reprolabel sets last year. They're not mine, but I can sell on his behalf, just as Megamus and Gen1fan assist one another. a. to resell (tickets, merchandise, etc.) at higher than the official rates. b. to buy and sell so as to make small quick profits. PER PERSON, not Per Badge. Even if they didn't do anything underhanded and sneaky it went against the Spirit of what Botcon was TRYING to do when whoever it was announced they had AT LEAST 3 of the sets. And I got DARN lucky to get my set, they announced being sold out only about 3 or 4 minutes AFTER I bought mine, and this guy wasn't alone. there were people walking around the con on Friday trying to sell theres…. With the 5 Figure set I can understand…. you had to get that along with a full acess ticket… but for People who then stood in a second line to buy figures and then immediatly turn around and sell them…NO…BS there is no defense for that. My figures went into my personal collection, there's bags destroyed when I tore them assunder… A guy who had at least 3 when the Cons Website says each person is only supposed to get ONE gets no defense. Let me point out for starters that you are assuming ONE person had three. Megamus and Gen1Fan, TWO people, are what is at question here. Selling two previously at whatever price is undoubtedly a combination of both of their allotments, not just one or the other's, as they work together each year. Your quote, as clear and accurately from the website as it is, does not reflect the reality of how it works. A person who had numerous Primus Packages in their own name would not be allowed to pick up numerous exclusives themselves, according to what the staff was able to tell me about the way that setup works. However, someone who has both a Primus and a Dealer registration is allowed one per registration (which is the same as one per badge, in this case). I myself had this arrangement, and used it. Neither one has been sold. Maybe neither one will be. But I am considering parting with my previous standard of buying doubles of some eclusives, much as I parted with my previous standard of buying double of all exclusives. If I choose to sell that, how is it any more fair for me to do so, than for Megamus or Gen1Fan to do so? I have every privilege to own that second set, and every right to do with it as I please once I chose to redeem my ability to purchase that set. I also wonder on the timing of when you claim they had extras. As of Saturday, anyone could take another spin through the line, and get another set on their badge. If you established that this was from a third set on Saturday, then you have no right at all to be upset at them for getting it, no matter how you choose to interperet the exclusive restrictions. I could have gone through and gotten more sets with my own badges, if I had been so inclined, and the Saturday part is indeed spelled out clearly in the same text you quoted from. Dude. You're talking about Gen1Fan and Megamus here. There's no question about it, and I was going to leave their names out, but this needs to be made clear. They have no "employees" to get them extra sets. It's just them. Anything they had, they acquired fairly. Whatever your thoughts on their attitudes, they're OK guys at the root of it and they play fairly. They were even part of the effort to get the Animated product distributed to the con-goers at cost. They, like myself, even gave some of it away as prizes. If they had both a Primus and a Dealer package, they had every right to buy a set for both badges and do what they pleased. Any issues you have with their prices are your personal freedom, but there's no need to start assuming they did anything against the rules or to circumvent them. Agreed. It's not Hasbro's responsibility to be concerned or watchful for scalpers. They wanted Animated toys in the region, they got it. I stopped by a couple of Wal*Mart and Toys 'r Us stores in the area on the way to the 'Con, and they each had plenty of wave 1 left. Honestly. I mean, I see where the dealers that had Animated were trying to make a profit, and they were well within their right to do so. While I wasn't willing to pay double-price for an Animated toy, there were plenty of people who were. It was obvious with all the people snatching them up around the room. For those like me unwilling to pay that much, there's no need to gripe. Insane Galvatron and I just dropped by an area Walmart on the way home and easily found and got some Animated figures at retail. Patience is a virtue, so there's no need to complain. Maybe this is overkill, but I gotta hang this one on Hasbro. Just when it seemed like the botcon situation wouldn't cause nearly as bad of a problem as it did last year, Hasbro had to go and release animated figures in that area only. Man that's pouring fuel on the fire. And they can't honestly sit there and give that stupid excuse of not knowing there would be such a great demand for them crap either. They like to say that a lot. On the other side, it does create a bigger frenzy and that's all they probably care about. Hype + frenzy = mega sales. So it may be a smart move on their end, but it's rather dirty if you ask me. went to the kmart by the airport in ky and got all of wave 1 and 2. they were right in front on a pallet. yeah for me. didnt have enough money to pick up anymore. spent it at botcon. 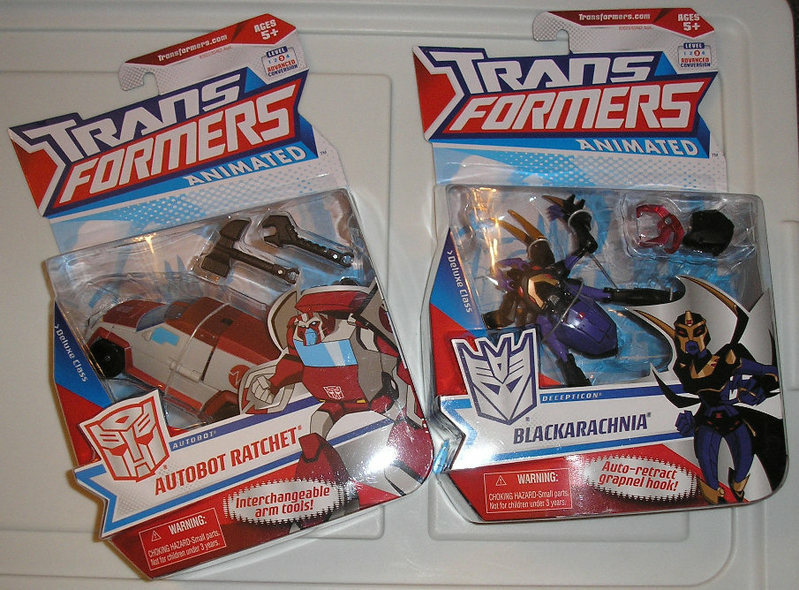 I guessed they were out when I saw nearly half a dozen of them on ebay, anyone here lucky enough to get Rachet? Me, 2 of em from a board member. Happy Day!! We snagged whole bunches of Wave 2 around the area. 3 sets for 3 people just to find out that more TFWers wanted them. Well It's pretty easy to guess how a dealer got 3 or more sets with the rules saying a person gets just one. He had his employees get them and then he could resell it. And it wasn't just a $35 markup. he was selling ONLY Megatron for $150 which is almost triple price. Plus it was the arrogence of the way he presented the deal. When I declined the inflated price politly he acted as though I were foolish to turn down such a "Good deal"… Stating it was sold out….Then I walked into the dealers room the next day and bought it at the Convention booth. Well if anyone finds more of these out today and is in the mood to spread the joy to their fellow TF fans then be sure to run home and PM me immediately!